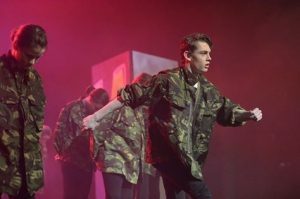 Rock Challenge has taken the Highlands by storm over the last couple of years with more and more schools getting involved in the multi-arts extravaganza...here Ciaran talks a little more about his breakdancing and involvement in this years competition. Why do you break dance? It makes me feel energetic and happy. What equipment do you need to break dance? No equipment, just slabs in the back garden to breakdance on. Do any of your friends breakdance? In a word: NO, I am the only one of my friends to break dance. How long does it take to perfect a move? About 1 week or more. I tend to try and learn parts and add bits on afterwards. Are there any famous break-dancers? Dytto, Fickshun, The Production [big group encompassing lots of dancers] Look them up! How was the Rock Challenge? I wasn’t as nervous as I thought I would be, on such a big stage, but it was great fun! Was it your own choreography? All mine. What would you say to someone thinking of having a go? Definitely do it!! It’s a lot of fun putting the time and effort in, it’s worth it and anyone can do it!